Forestry and timber investing – Can it be sustainable? Forestry and timber investing – the very concept seems either dull or extremely alien to most people. After all, it’s much more satisfying to follow the rest of the herd and chase the latest hot social networking stock. However individual investors – especially those looking for diversification and stable returns – are missing out by ignoring the value timber investments can bring to their overall portfolio. Noted stock market skeptic Jeremy Grantham of GMO Asset Management has long been a fan of timber investments (whilst being quite pessimistic about the long-term returns on offer from global equities at their current valuations). First, as a “hard asset,” timber investments are an excellent hedge against inflation. The returns on timber investing have been quite impressive. According to the National Council of Real Estate Fiduciaries in the United States (NCREIF), timber returns from 1987 through 2010 have averaged 15 per cent? per year, whilst the main US stock index - the S&P 500 - has gone up only 9.1 per cent annually. Furthermore, on average the price of harvested timber itself has gone up 5 per cent per year over the last 100 years. Timber investments also perform extremely well when stocks are in a Bear Market. For example, in 2008 when stock indices lost as much as 40 to 50 per cent, the NCREIF’s main timber index actually went up 9.5 per cent. As another example, during the Great Depression when stocks fell anywhere from 70 to 90 per cent, the main US timber index went up 233 per cent. The returns on forestry and timber investments are not correlated to the returns provided by stocks and bonds, which means that they provide true diversification. The challenge with timber investing, however, is whether it can be done in a truly sustainable fashion or not. Some of the statistics are truly frightening. Clearly, the world’s forests are steadily shrinking. There was an estimated 90,000 sq km per year lost in the 1990s, with the result that half of the world’s forests, which originally covered approximately 46 per cent of the planet, are now gone. Tropical deforestation in particular – primarily caused by the attractiveness of tropical hardwood timber – is the highest in the world at approximately 130,000 sq km lost per year. (This data is from the United Nations’ Food and Agriculture Organization/FAO). 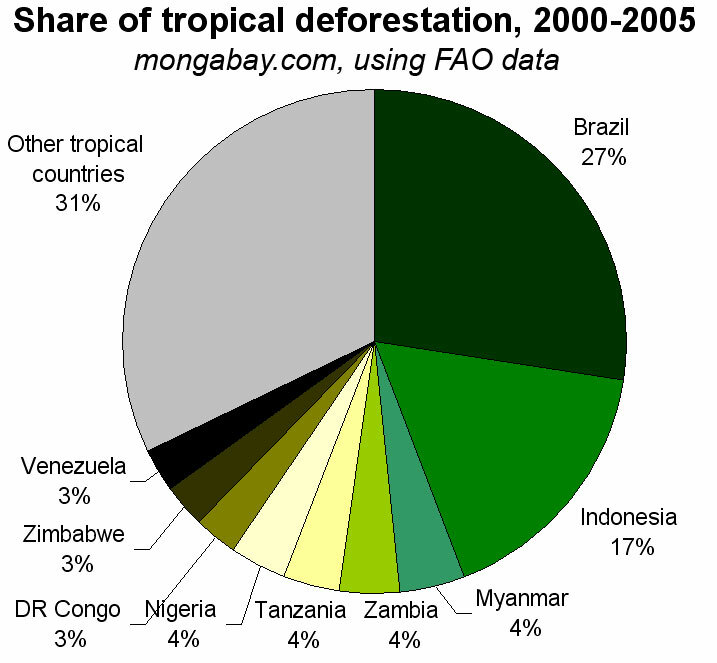 According to this pie chart based on figures from the FAO, approximately 17 per cent of this tropical deforestation occurs in Indonesia, 4 per cent in Myanmar, and 31 per cent in other tropical countries, many of which are in SE Asia. The loss of our tropical forests is a true human tragedy. Scientists believe that as much as half of the species on the planet live in tropical forests, and many of these species have yet to be discovered. Tropical forests also store vast amounts of carbon dioxide (CO2), and when they are cut-down, that CO2 is released into the atmosphere as a greenhouse gas. On the demand side, global lumber use is expected to double in the next 30 years, and China is on track to replace the US as the biggest consumer of wood in the world. Unfortunately, the demand for hardwood is causing severe environmental degradation. The question is: are the attractive returns on order from timber investing in irreparable conflict with concern for our environment? Luckily for investors, the answer is no. Timber investing does not have to mean large-scale destruction of native forests. Managed forestry with tree stocks carefully controlled within specially designed plantations is an extremely sustainable way to benefit from the advantages of timber investing. The plantation owner will tend to the growth of trees, and then harvest them in a sustainable fashion, without touching any tropical or other native forests. There are two basic types of direct timber investments available. The first – and more traditional option - is to invest in pine forests, which has historically been done in the US. However, pine is a softwood, and a substantially better investment returns can be made by investing in hardwood trees. There are now an increasing number of forestry and timber investments that are easily accessible by individual investors. We have observed a number of sustainable hardwood timber projects in tropical countries such as Costa Rica and Sri Lanka that are available to individuals. If one does not want to take on the political risk that comes with owning assets in developing countries, there is also a rather unique hardwood timber investment we have found in Germany. Of course, no investment is full-proof and forestry should simply be a small part of a broad portfolio, but if you are looking for opportunities that are both profitable and sustainable, timber investments are well worth a look. Josh Cohn is a Partner at GreenWorld (BVI), a firm that offers green investment opportunities to individual investors. They are on the web at http://www.greenworldbvi.com and can be reached at info@greenworldbvi.com. Information on their investments is at http://www.greenworldbvi.com/investment-options/timber/.